That link leads to a page where he can choose a format: Android phone or tablet, Apple phone or tablet, Kindle or other e-reader, and so on. It’s a nifty system, and it’s a good way for people who come across an author’s website to get on his newsletter list and to get a free book. But it presumes that people are on their computers and are going to his website. What about live events or where the author meets people one-on-one? Now BookFunnel has that covered too. Its new service is called Print Codes. The author is able to download unique access codes that he can distribute to people whom he meets in person. 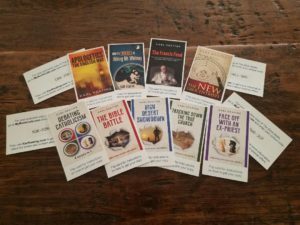 What I’ve done is to have printed (through Avery.com) business cards for nine of my books. On one side of each card is an image of a book. On the other side are instructions on how to redeem the unique code. I print the codes on clear labels and affix them to a blank area in the middle of the instructions. The codes are good for one use. They can’t be reused, so there’s no danger of someone making multiple copies for his friends, and the codes expire after a time set by the author. (I chose 12 months, but I could have chosen longer or shorter periods.) Now I’m able to hand out complimentary copies of my books at will. On a recent hike in the Sierra Nevada I took along cards for my book How to Fail at Hiking Mt. Whitney. It’s a how-to book with a twist: it explains how to succeed at reaching the peak by avoiding things that lead to failure. At the trailhead campground I spoke with several people who planned to hike to the top of the highest mountain in the 48 contiguous states. I wished them well and gave them Print Code cards for my book, noting that I include a chapter on shortcuts that could save them more than a mile. They were pleased to receive access to the book, which they still had time to download onto their smartphones before their hikes. All I asked in return was that they consider writing a short review of the book at Amazon. The first weekend in December I’ll try using Print Codes in a different way. I’ll be speaking in Dallas at the Catholic Action Summit 2018. Like last year, I’ll have a book table there. Unlike last year, I won’t attempt to schlep heavy boxes of paperback books. I’ll use Print Codes instead. At my table I’ll have sample copies of my books in paperback form, so people can flip through them and see what they’re about, but the only books I’ll sell will be ebooks. For those I’ll just need to take along Print Code cards, which I easily can stuff into my suitcase, along with the sample paperbacks.